Membrane reactors are increasingly replacing conventional separation, process and conversion technologies across a wide range of applications. Exploiting advanced membrane materials, they offer enhanced efficiency, are very adaptable and have great economic potential. There has therefore been increasing interest in membrane reactors from both the scientific and industrial communities, stimulating research and development. The two volumes of the Handbook of membrane reactors draw on this research to provide an authoritative review of this important field. Volume 1 explores fundamental materials science, design and optimisation, beginning with a review of polymeric, dense metallic and composite membranes for membrane reactors in part one. Polymeric and nanocomposite membranes for membrane reactors, inorganic membrane reactors for hydrogen production, palladium-based composite membranes and alternatives to palladium-based membranes for hydrogen separation in membrane reactors are all discussed. Part two goes on to investigate zeolite, ceramic and carbon membranes and catalysts for membrane reactors in more depth. Finally, part three explores membrane reactor modelling, simulation and optimisation, including the use of mathematical modelling, computational fluid dynamics, artificial neural networks and non-equilibrium thermodynamics to analyse varied aspects of membrane reactor design and production enhancement. 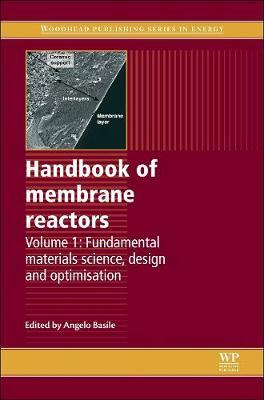 With its distinguished editor and international team of expert contributors, the two volumes of the Handbook of membrane reactors provide an authoritative guide for membrane reactor researchers and materials scientists, chemical and biochemical manufacturers, industrial separations and process engineers, and academics in this field.